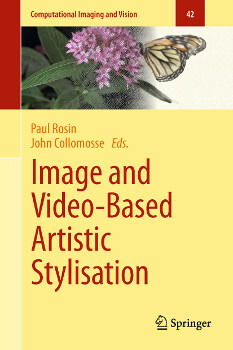 I have contributed to two chapters in the new book entitled »Image and Video based Artistic Stylisation«, edited by Paul Rosin and John Collomosse, and published by Springer. The first one (Chapter 3 of the book, co-authored with Oliver Deussen) surveys image-based halftoning and stippling techniques, while the second one (Chapter 15 of the book) discusses validation and evaluation techniques applicable to and specific studies conducted in the field of non-photorealistic rendering in general. The book, overall, covers a wide range of modern image-based techniques for stylizing images and videos, an important sub-area of the field of non-photorealistic rendering. Please note that the on-line version of the chapter on halftoning and stippling offered electronically by Springer does not contain the images in a sufficient quality. Please use my author version of this chapter linked below to see the correct figures.